The fueling connection devices of compressed natural gas vehicles (NGV) include the receptacle, protective cap, nozzle, and valve(s). As the conduit through which compressed natural gas (CNG) passes from the fueling station, where the methane is compressed and stored, to the vehicle, which uses the pressurized resource as fuel, fuel connection devices, on both the vehicle and fuel dispenser system, must be able to handle CNG at its anticipated pressure. Furthermore, the fueling nozzle – the device that permits quick connection and disconnection of the fuel supply hose to the receptacle (device permitting safe transfer of fuel) in a safe manner – can be designated according to its use and design. These classifications are listed and detailed in CSA/ANSI NGV 1-2017. Type 1: For use with dispensing hoses that may remain fully pressurized at dispenser shutdown. This nozzle makes use of an integral valve (or valves) that stops the supply of gas and safely vents the trapped gas before allowing the disconnection of the nozzle from the receptacle. Due to the safe ventilation of the gas prior to disconnection, this type is primarily intended to be used at public fill stations. Type 2: For use with dispensing hoses that remain fully pressurized at dispenser shutdown. This type makes use of a three-way valve connected to the inlet of the nozzle, which safely vents trapped gas prior to nozzle disconnection. The vent valve operating system is external to the nozzle, and this type is meant to be used by trained operators only. Type 3: This nozzle is used with dispensing hoses that are automatically depressurized at dispenser shutdown, and it is intended for trained operators only. Class A: this class specifies high frequency use with a cycle life of 100,000 cycles. Class B: this class specifies low frequency use with a cycle life of 20,000 cycles. 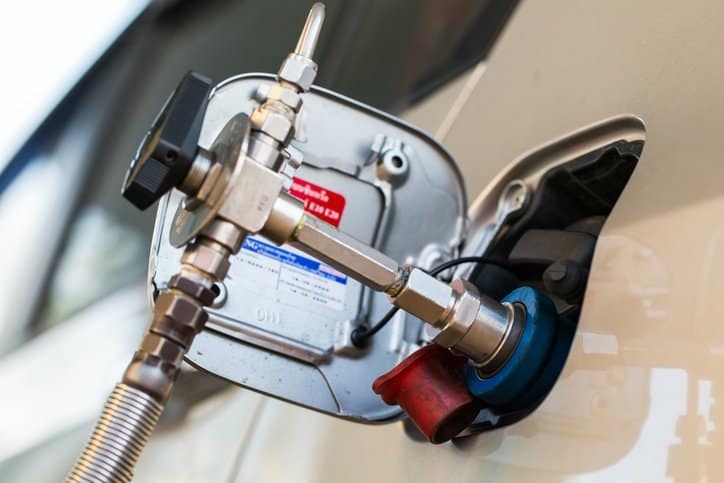 CSA/ANSI NGV 1-2017 specifies newly-produced compressed natural gas vehicle fueling connection devices, particularly those within the aforementioned service pressures that control NGV fueling in a safe manner. The standard covers background information and construction and assembly guidelines, as well as performance testing for receptacles, fueling nozzles, and Type 2 three-way valves. CSA/ANSI NGV 1-2017 was prepared by the NGV 1 Technical SubCommittee on Standards for Natural Gas Fueling Vehicle Receptacle and Fueling Connection Devices. Components used in systems designed with its guidelines should be designed for use with gas complying with SAE J 1616-2017 – Recommended Practice for Compressed Natural Gas Vehicle Fuel, or an equivalent national standard. CSA/ANSI NGV 1-2017 – Compressed natural gas vehicle (NGV) fueling connection devices is available on the ANSI Webstore.